Lindsey was introduced to Barbershop in the UK in 1992. She joined Sydneytown Chorus after moving to Australia then became a founding member of the Circular Keys Chorus. 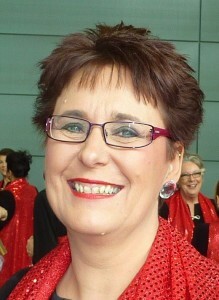 In 1998 Lindsey returned to Sydneytown Chorus, this time as their Director. In 2005 Lindsey became the founding director of Aurora Australis. In 2007 she moved to Perth, Western Australia and formed part of the team that founded A Cappella West – their founding director! Lindsey is a certified director, a motivational and enthusiastic coach and teacher and brings skills and knowledge gained from attending many regional and international Sweet Adelines events. Her areas of interest are vocal production, voice placements, singing bass, competition preparation and the sound category. Lindsey has sung bass in two Regional Champion Quartets: iCappella and Hi-Jinx.